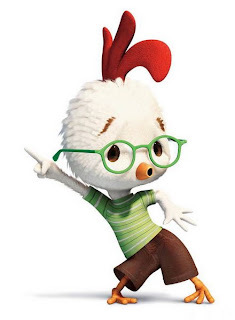 Falling sick is not always bad…. And I got to know this very recently. Thanks to all these season changes and all, I was so much sick that I didn’t go to college for a full weak. But this time I actually fell in love with my fever…cough and cold. You must be wondering “why?…why?…why?”. Because I got to take my long pending rests….infact I rested so much that I got tired of taking rests…. But what to do in that case….I spent whole lot of time in chatting and doing nothing. :D . Right now my deepest acknowledgement goes to G-talk and YM…because of these I got two more lovely friends. 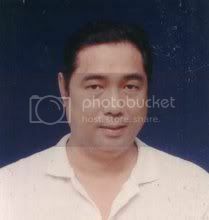 Ok..ok.. thanks a lot to blogspot.com too as this one is the main platform. Hmm..so now four of us rock together. Together we four are stars, mad-angels, gems, dumbis (though someone amongst us doesn’t agree to be a dumbi! :P ) , and what nots. During these days one more not so old friendship has also gained a new dimension. It has grown sweeter, lovlier, more beautiful, and stronger. That sweet and cute friend of mine never forgets to give me some short-n-sweet dozes of valuable gyaans coated with love and wrapped in care every now-n-then. What I have not told this cute friend yet is that I really love those dozes of gyaans very very much. I actually look forward to listen to them each n every day as these li’l gyaans fills my days with much more meaning and beauty. What more!.. one of my dearest and nearest friend is getting married that too very soon. she calls me her thakma(grandmom). oyi natni...me soooooo happy for you. May God bless you always and all the happiness of this universe be yours. As if all these happinesses were not enough and thus I was blessed and honoured with so many beautifully encouraging awards from my blogger friends. So now as per tradition I am passing forward some of these awards and trying to spread the happiness every where. 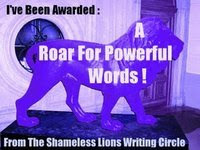 *** Spirit (a damn powerful writter) has blessed me with “A roar for powerful words” Award. Thanks a lot dear, I am honoured and happy too. And now it’s my turn to forward it to five more bloggers who according to me are powerful in there own unique way of writing. P.S :Mel I know you don’t accept any awards. But when it came to select a powerful writter I was not able to replace your name with any other name. I am sorry if I have hurt you. But please don’t misunderstand me. This powerful lion has a cute tail…. Yes I need to write three thing about what I believe are necessary to make writing good and powerful. Gosh! What to do now? … I never thought of it … But the three things that are coming to my mind are: HONESTY, LOVE and RESPECT. How could our writing be powerful untill and unless we are not able to acknowledge the truth…not honest to whatever we write…to our thoughts and imaginations. Love and respect for writing along with being honest is what I think necessary to make any writing powerful. You can read the rules for the award here of how to pass it on and such as well as pick up your own copy of the award. ***The next couple of awards are from LENA: Thanks my Lenu-Janu for all your love, support, encouragement and being just a huggs away whenever I need you. yes lenu…u do have my heart and so do I have yours. 2. 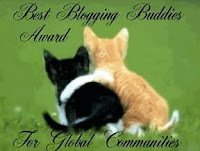 Excellent blog award: Shalini and Spirit too gave me this award. I would pass it to : Sami, Divvu, Indro, Priya, Virtual Rambler, Akila, Noushy, Mann, kalyan. 4. You Make My Day, 5. Friendly Site, 6. Best Blogging Buddies, 7. Forever Friends: for everyone on my blogroll. 2. 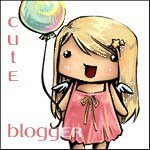 Cute blogger: Who is more cuter Divvu...Me or You..?? :D I would pass it to: Spirit, Kaushiki, Heidi, Arpan, Sami, Shalini, Sandhya, Lena, Mads, Mann, Akila. 3. 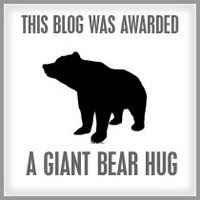 Truly Sweet : It's for everyone on my blogroll. 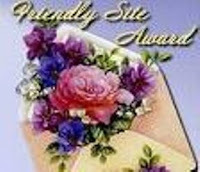 ***Now comes Shalini’s Awards: Thanks a lot dear. You never keep yourself behind in encouraging me. I am really lucky to have you as my friend. 2. Interesting Blog: I would pass it to : Sami, Divvu, Shashi, Shashi(doc), Lena, -Xh-, Compassion Unlimited, kalyan. 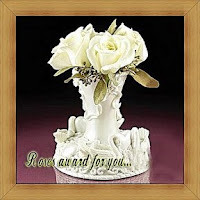 White Roses Award: May all our friendship bloom like these beautiful white roses. God! So much love, appreciation and accolades! Do I actually deserve them? … yes I do… I do… I do deserve them so u all do deserve them…and as u deserve them so please accept these li’l love tokens and spread the happiness everywhere. Oh! That's not the ennnnnd of it! The icing on the cake was this new personalized template. Isin’t it breathtaking? God! I just love this new template. It reflects me so..so..so well. I am wondering Lenu-Janu, how do you know me so well! …The tempu you made for me is “So Much Me”! Such a long and a sweet post!! And no, i will not call you "dumbi" in front of all, dumbi!! I just loved your new headder image and you just rock girl. All sweet awards and thank you again. Will update soon. hmmm seems tht u had one of th most bleessed fever of ur life... :) Hope u ahve many more days ahead..
wow! I love your template it's soooo beautiful! Hope you feel better now and glad you had a grand time even with the flu on. hey congrats on so many awards.. truly deserved these awards..
AND FOR ALL thse lovely awards , U take my Bow in reverence to ur exclusive spirit and ur kindfulness.. I actually do not deserve all thse ,but still it makes one feel special whn ur works are honored. Thanks for the award but I have to give it to my Lord and savior, Jesus Christ for He is my inspiration for all my articles. No, I'm not mad at you. Why I should I be? You just gave honor to me and I passed it on to my Lord. I should be so thankful for that. But I could not give the award to somebody else. To me, all my blog mates are the best and the recognition for them I give through my comments and my visit to their blogs. I hope you understand. Thanks again for the award and the post. God bless you and your family always. Thanx for ur comment on my blog.... n encouraging me. BTW r u on Orkut???? nice to know that you gained so much during your fever days....hope you well now....it's really a very cute gesture that you distributed all your prizes among your dearest friends....hope you get more spare time for your friends....but not the fever again....wish you all the best. Sweetu you deserve all these awards and much more!Thanks for the awards dear,mere blog mein jagah kam pad raha hai ab,he he. The new template rocks darling,yup it's so very you! 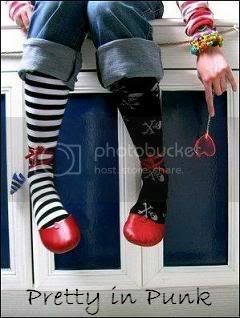 Oh, you are such a dearie!!! 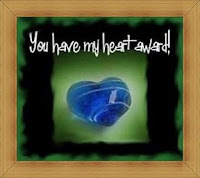 :) I've added your post to my list of awards. I shall add them to my blog soon (you know how I am about getting things). You rest up dearie. No need to rush around, take your time, feel better, and RELAX!!! God/dess(e/s) above know you deserve it. Love and blessings. I send you e-huggs! Glad that you're OK now and yes,things hppn for a reason...a blessing in disguise!! Thanks for the lovely post and the awards. Will grab and post it soon. Hope our friendship remains as fruitful 4eva. p/s The template look gr8! u deserved the break, the great friends, the lovely awrds and the beautiful template! i knew that it was lena's template the moment i opened ur blog! sweet she is! WOW.. 1 week rest for all the college professors..ha ha.. yah they escaped frm u na. Its always nice to acknowledge the ppl who r with us... u hv done it well with ur longggg post. thanku thanku so muuuucccchhhh.....for the sweetu award...nd am sorry...eetne din gayab rehne ke liye....finaly loads apologies..nd thax..
Preeti, thanks for visiting Apples of the Eyes! :) glad to have you there. wohoooo!! i can see so many awards in here, you must be special to receive all these wonderful awards. Congratulations to you. 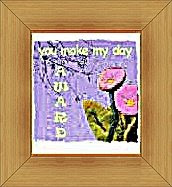 Hope you have a gr8 w/end and keep smiling. Glad to see you around and yeah, you deserved all those awards! Thanks for your generous comment in my blog, I appreciate it dear. Sometimes God has a plan for us that we don't know and by getting sick as what hppnd to you, there were so many good things awaiting for and hopefully you have a good break as well..but surely we don't wish to be sicked!! 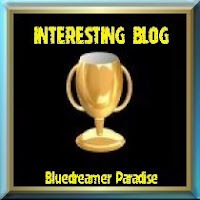 WoW...this is simply a rainfall of awards...your blog really deserves them as also your new template looks lovely....Thanks very much for sharing the awards & Have a wonderful happy time with all the blessings in life!